I had proposed to various climbing friends a Fall trip to Florida Peak and Dos Cabezas Peaks for quite some time. Those goals were realized in this journey. The Florida Range lies prominently in the gaze of many an Interstate 10 motorist just south of Deming, New Mexico. 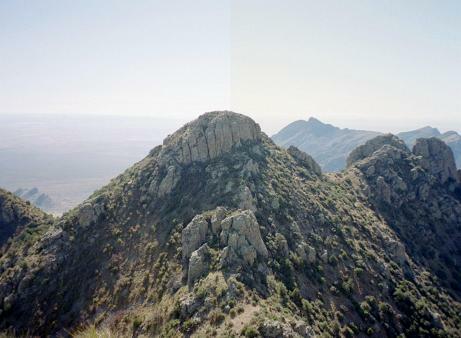 Dos Cabezas Peaks (Spanish: "Two Heads") are the pair of conspicuous bumps south of Interstate 10 near Willcox, Arizona. Both Florida Peak and Dos Cabezas Peaks share key features which, taken collectively, provided sufficient allure for us to climb them. Each peak is actually a pair of summits with nearly equal elevations. 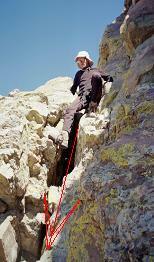 For each pair one summit is semi-technical with a rope being available for safety. For each pair one summit has over 3,000 feet of topographic prominence - the other peak receiving a mere pittance as examples of the winner-take-all phenomenon of prominence science. These large prominences place Florida Peak high on the New Mexico Fifty Finest list, and Dos Cabezas Peaks on the Arizona Fifty Finest list. In order to claim these prominences we had to climb both summits of each pair since at the onset it was not known which summit is the higher of the two. The original plan was to climb just these two summits as well as perform surveying duties for the Mystery Peak USGS quadrangle. However transportation considerations suggested that I expand my journey to include several days of prominence-oriented peakbagging in New Mexico with Bob Packard. 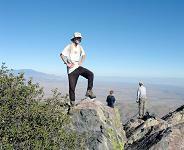 John Hamann of Alamogordo, New Mexico joined for the "core" component of the journey - Mystery Peak survey, Florida Peak (both summits), and Dos Cabezas Peaks. John's attendence was welcomed since he had already climbed both mountains and thus had a modicum of routefinding knowledge. Richard Carey of San Diego had just returned from a vacation in, of all places, Bhutan. It was the uncertainty of his availability to retrieve me at Tucson's airport that forced me to alter travel plans by appending four days of peakbagging with Bob Packard prior to the "core" efforts. Edward Earl of San Diego made a whirlwind weekend trip - flying into Tucson Friday evening and renting a passenger car for the drive to Florida Peak. He climbed both Florida Peaks, belaying Richard and Bob up the crux move of the technical, northwest summit. Indeed, Edward's presence may well have been instrumental in getting Bob and Richard up that northwest peak. After we all climbed Dos Cabezas' higher, south peak, Edward and I drove to Tucson in his rental car for a Sunday evening flight home. My day began at 6:30 a.m. I drove to Richard Carey's home in Point Loma where I delivered both his pair of my new book on prominence, as well as Gail Hanna's pair of books and a three pound box of chocolates for her as a holiday gift. Richard described his Bhutan journey and then drove me in his truck to the airport. Parking my pickup truck at Richard's home saved me a $40 airport shuttle ride from Del Mar. The flight to Phoenix went smoothly, and I arrived around noon. Bob Packard was occupied until noon and so could only begin driving south from Flagstaff at that time. We met at 2:50 p.m. and then drove for many hours to a camp just across the New Mexico border for our first hike the following morning. I presented Bob his copy of the prominence book, autographing it as he looked on. In turn I received a check for $100 - twice the normal purchase price. Bob explained that the difference is in recognition of my work maintaining the county highpointers website, www.cohp.org . It was wonderful to prepare food with a real stovetop and sleep in relative comfort atop a makeshift bed constructed from the dining tabletop and seat cushions. Moths and assorted flying critters were attracted to the ceiling light. The night air was mild for November. I was surprised by the rapidity that Bob Packard and I were able to secure New Mexico Fifty Finest summits - in turn because they were "near drive-ups" with minor elevation gains. We managed three of these peaks today, all of which have at least 2,000 feet of prominence. Brushy Mountain (7,620 feet) entailed all of 200 feet elevation gain from a locked gate on the approach road to the summit FAA radar facility (with a "Texas golf ball" radome). Eagle Peak (9,786 feet) entailed 450 feet of elevation gain from a saddle just prior to a locked gate. The dirt approach is 17 miles, with the final four miles requiring four wheel drive. Black Peak (9,029 feet) included perhaps 500 feet of gain, all but 100 of which is along the Continental Divide Trail. The final 100 feet is cross-country northwest from a saddle. After Black Peak we drove to a locked gate immediately below Signal Peak and walked the road for all of four minutes to the top of this high point - one without 300 feet of prominence. Black and Signal Peaks are sister summits of nearly equal elevation and maybe two miles apart. We returned through Silver City and camped for the night at the base of Jacks Peak Road for the next day. Today Bob and I secured two more New Mexico Fifty Finest summits. Burro Peak (8,035 feet) is accessed by a six mile drive up Jacks Peak Road to a carpark in-between it and sister summit Jacks Peak. 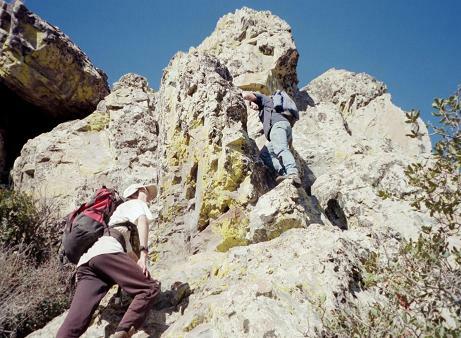 Descend perhaps 100 feet to a saddle; and ascend the Continental Divide Trail for about 200-300 feet to the Burro Peak summit. After returning to the camper we walked the service road to the summit of Jacks Peak with its various electronic facilities. Jacks Peak does not have 300 feet of prominence. We drove east on I-10 through Deming and, some twenty miles prior to Las Cruces, took a paved road north to Magdalena Peak (6,623 feet). A locked gate at 5,500 feet forced an actual hike this time, with about one hour and 1,100 feet of elevation gain to the summit golfball operated by the FAA. Remarkably, there was no "No tresspassing" sign to be found at the locked gate. Two vehicles passed us, driving down from the summit facility, and only friendly waves were exchanged. 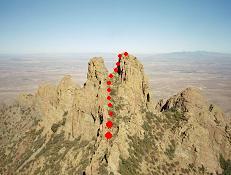 Although Magdalena Peak is on the New Mexico Fifty Finest list, it does not have 2,000 feet of prominence. 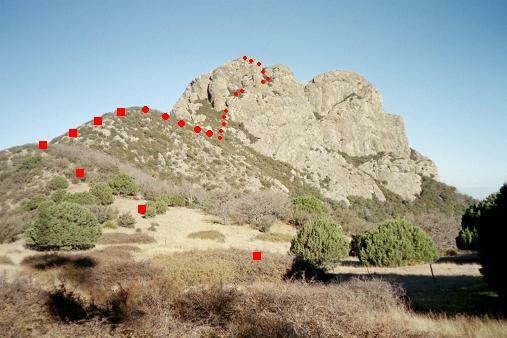 As the final, fiftieth entry, Magdalena Peak has 1,945 feet of prominence. It disappointed me to learn that I was not going to get a "P2K" summit in the effort. Bob and I returned west on I-10, turning south onto route 146 for the community of Hachita nineteen miles from the Interstate. We expected John Hamann to meet us by morning, as arranged by a series of cellular telephone calls, for an ascent of Hachita Peak. Bob drove 2.2 miles west on route 9, and turned south onto the dirt approach road for Hachita Peak. We camped near a water tank about one-half mile south of Route 9. At about 8 p.m. one Mr. Hurt dropped by wondering what we were doing there. The land is public and yet, were it not for explaining that we were there for just one night and only wanted to climb the peak, Mr. Hurt would have asked for our departure. Bob and I climbed Hachita Peak (6,639 feet). John Hamann had not appeared at the Route 146 / Route 9 junction in Hachita at 7:30 a.m. - the designated meeting time. We had waited until 8:40 p.m., over one hour, and then left to climb without John. The hiking route entails some 1,500 feet of elevation gain and consumed three hours. An ATV track ascends a ridge immediately west of the westernmost of three summit ridge subpeaks. From there a horse path proceeds east, bypassing the two lower subpeaks along their south faces. One then climbs the final 200 feet of the easternmost and highest subpeak - the Little Hachita Range highpoint. Details of the climb are available. Bob and I returned to within ten air miles of the Interstate when my cellular telephone started functioning. We learned that John H. was unable to attend because of work constraints - but that he definitely would meet us from 1-3 p.m. on Thursday, at the same road junction in Hachita, for climbing the next day. Bob and I were thus free to climb Alamo Hueco on Thursday without having to meet John. As we drove through the "community" of Alamo Hueco we were stopped by Mr. Hurt. He certainly gets around! Mr. Hurt barked that we had been on private property ever since leaving Route 81 about seven miles ago - and that the road itself is private in addition to the adjoining land. 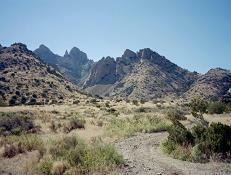 Mr. Hurt would not allow us to camp near the base of Alamo Hueco - let along climb it the following day. He refused to consider a liability waiver; a $100 bribe; and in general could easily have granted us permission to climb Alamo Hueco and yet summarily decided not to. Mr. Hurt oversees a huge parcel of land from the Mexican border to Hachita. The land is leased from an oil company as ranchland. Contacting Hurt Cattle Company (Deming, NM) will likely meet with resistance to any request for access. I know Bob Packard well enough to state confidently that he will eventually climb Alamo Hueco - albeit via a circuitous driving approach to the east side of the range followed by a hike on public lands. I think Bob should have "done his homework" prior to setting out - asking various Fifty Finest list completers how they climbed Alamo Hueco. We camped west of impressive Big Hatchet Peak at the same location where I had camped prior to climbing it in April 2004. The large, black "oil drum" was still there - about one-quarter mile east of Route 81 and just south of a bend in the road with a nice, 300 to 400 foot tall hill. We wished to meet John H. around 2 p.m. - so precluding, for want of time, exploration of the approach road to, and an ascent of Alamo Hueco Peak from the east. Bob and I examined the Cedar Range near Hachita as our day's alternative entertainment. Two peaks of identical elevation compete for being the range highpoint. We found that approach roads leading to near both peaks were in poor condition - suggesting a hike that again we did not have time for owing to distance. near the route to summit of Mystery Peak. We drove west to Mystery (the town) for gasoline, snack food, and ice. The nearbly Pyramid Range provided a worthy means of spending the day. Bob parked his camper northwest of Pyramid Peak (6,008 feet), and we climbed it via the west ridge after a walk southeast across the desert floor from a dirt road that connects Lordsburg and Route 338. We were pressed for time owing to the meeting with John H. Beginning the climb at 9:44 a.m. we calculated that a return to the vehicle in four hours would, after allowance for driving time, have us at Hachita before 3 p.m. - the outside limit of our meeting window. In light of the timing and the fact that I take longer to eat my summit food than Bob, I decided to climb ahead of him on the final summit push from a saddle northwest of the summit and 750 feet below. I am pleased to have hiked this final portion in 16 1/2 minutes - a blazing 2,700 feet per hour rate of ascent. Bob also "huffed it", and we were heading downhill at 11:26 a.m. - followed by a return to the camper around 12:50 p.m.
We were happy to have "salvaged" the day by climbing a range highpoint. Bob and I arrived at Hachita at 1:57 p.m. - just three minutes from the projected mean arrival time. John Hamann was there, and I transferred my belongings to his vehicle. Bob drove south for an ascent of Big Hatchet Peak the next day. John and I drove to the Mystery Foundation Office (MF) for paperwork required to survey the Mystery Peak quadrangle. John drove to the Coronado National Forest for camping. We found Richard Carey already there, having driven from San Diego with a few Arizona peaks climbed in-between for completeness. After supper John and I talked a long time about the various New Mexico Fifty Finest peaks on the White Sands Missile Range (WSMR). These summits are completely off-limits, and the only means by which they've been climbed has been through special arrangement. Without Bob's camper and yet with my sleeping bag (delivered by Richard), I slept on the ground in-between John and Richard's vehicles. The night was remarkably warm for November. Our survey of the Mystery Peak summit (8,565 feet) and nearby benchmark was not without incident. The summit cairn is now considerably enlarged, with several 100-150 pound stones captured in a pyramidal 4-foot tall structure. There is a makeshift radio transmitter located about fifty feet west of the benchmark, with solar panel, battery, transceiver, and antenna. I have notified the MF authorities about this device - one that may very well have been placed by either drug trafficers or an illegal alien smuggling operation. Then again, the unit might be part of either a wildlife research study or United States Army communications exercises. An attempt to visit the northern subpeak with its benchmark (8,531 feet) was thwarted by high winds and heavy brush along the ridge connecting it with the main, southern summit. We turned back about one-third of the way. The northern subpeak has less than 300 feet of prominence. Return to the gate with combination lock brought a flurry of bad news. John H's vehicle had a note affixed to the windshield indicating that it as well as Richard's vehicle had been spotted by the Border Patrol - and that an explanation was requested upon return to the MF office. I explained that John's vehicle, the one indicated on the paperwork, had insufficient clearance to negotiate the approach road. Thereby we swapped Richard's vehicle in place of it - and that at no time did more than one vehicle have access to the Mystery Range. With my gear now in Richard's vehicle we drove through Deming and camped along the eastern flank of the Florida Range. Bob Packard had successfully climbed Big Hatchet Peak, and arrived as Richard and I were finishing supper at about 6 p.m. John H. arrived shortly after, leaving Edward Earl to come from Tucson. True enough, Edward, guided by the white and red strobe lights of Richard's vehicle, arrived at 10:55 p.m. and promptly slept on the ground with sleeping bag. All of us were now present for the climb of Florida Peak's two summits. We arose as usual at 6 a.m. with reds and oranges of dawn along our eastern horizon. The ascent of both Florida Peaks commenced at 6:46 a.m., with the route beginning as a road walk west into the hills. Much of the route entails heavy brush, and we were delighted to reach a saddle immediately underneath the southern, technically easy Florida Peak around 9 a.m. under clear but windy conditions. back to the tamer, southern Florida Peak. We trivially ascended Florida Peak (7,448 feet) with some 200 feet of elevation gain. On top we got our first views of the harder summit just 0.2 mile away - a pair of rocky buttes that appeared very difficult to climb. We descended to the saddle in-between the two Florida peaks, and then climbed up a brushy slope to the saddle in-between the pair of buttes that comprise the northern summit of Florida Peak. The eastern butte is slightly higher, and has an obvious Class 4 route along the northernmost part of its western face. We left our packs at the saddle and climbed this route to the top - an elevation gain of maybe fifty feet. The section suggesting use of rope is only ten feet tall. Edward free-climbed the route and constructed a belay for anybody requesting it. John and I free-climbed the section. Richard and Bob were belayed from above. On top all of us gathered for a few minutes of silence, admiring the magnificent desolation of the New Mexican desert in all directions. I descended first - if only to eat my lunch food sitting at the saddle inside my daypack. John followed, taking photographs of Richard and Bob as they were belayed by Edward. Finally Edward downclimbed and we all were back at the saddle with success. summit to the twin buttes of the north summit. 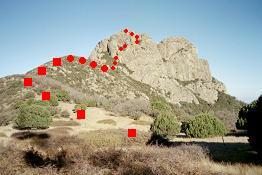 Red indicates the preferred route of ascent. Which Florida peak is highest? A hand level indicated that the northern, technical summit is 2 or 3 feet higher. However several of us, including myself, swear that unaided visual inspection suggests that the southern, easier summit is higher. John Hamann has provided a description of Florida Peak at Summitpost.org. The day was now uncomfortably warm for mid-November. We were all back at our vehicles around 1-1:30 p.m., having taken about two hours for the descent. With our cars at some 4,770 feet, the net elevation gain was some 2,700 feet - the total gain some 200 feet more. Bob Packard separated from us, with the goal of West Blue Peak for Sunday - yet another of New Mexico's large prominence peaks. I drove with Richard into Arizona for my final venue - Dos Cabezas Peaks. We arrived around 5 p.m. to the locked gate at 6,100 feet in Mascot Canyon on the south side of the range, and made camp at a pullout perhaps 100 yards before the gate. John arrived maybe an hour later, parking about 100 yards farther down the road. Richard and I had been concerned that Edward's vehicle would not negotiate the rough approach road - so suggesting a plan for retrieving Edward using one of our more capable trucks. However Edward arrived around 6:30 p.m. without incident in his rental car. His pair of chili dogs bought in Willcox were stone cold - but that was not as important as his timely presence with the group. After a hot supper of spinach parmesan noodles (chili and tortilla chips for Richard), we all spent a good hour and one-half talking about the world of subjects before turning-in around 9 p.m. I slept on the back seats of Edward's rental. It is believed that the southern rock mass of Dos Cabezas Peaks is higher than the northern rock mass (elevation 8,354 feet). John H. had climbed it with a large group in 1995, and had some knowledge of the route taken. We walked the gated road to a 7,200 foot saddle, and then hiked uphill to an obvious radio tower at 7,880 feet immediately southeast of Dos Cabezas Peaks. After a break, we continued to the south base of the southern rock mass - only to find no obvious route to its summit. One crack ascended to the right but was used without success by Richard in 2003. John noted that the key to success is a hidden ramp located behind a lichen-covered rock plainly in view. Unfortunately access to the hidden ramp was only possible by going through some extremely heavy brush. That brush was the "crux" of our climb. Brush thick enough to tear your clothing. In contrast, the hidden ramp was like a golden staircase leading counterclockwise to the summit area. One continues east in ascending fashion, and then turns north to an obvious gully pointing northwest and with a chockstone wedged inside the only nontechnical means of passage. Climbing under and then over the chockstone is the Class 3+ crux of this route. On passing under the boulder I expressed concern about its stability. Edward replied, "Like a Beauty-Rest mattress." Huh? Oh yes: "Forever Firm." 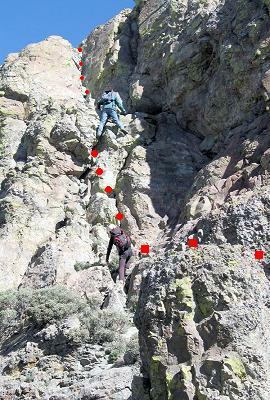 Within twenty vertical feet is a steep section with excellent handholds that leads, in southerly fashion, immediately to the summit plateau. Richard had brought a heavy duty machinist's surveying instrument. Using it, he and others verified that the north summit is about five feet lower than the south summit of Dos Cabezas Peaks. The five foot value was corroborated by Mark Adrian in the summit register. The north summit was obviously lower by visual inspection as well. 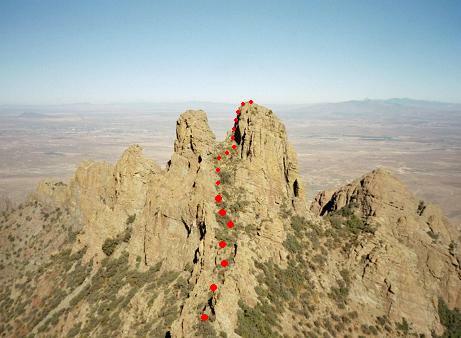 Given the above observations there was no need to climb the northern rock mass in order to claim Dos Cabezas' more than 3,000 feet of prominence. However we had plenty of time and had planned to visit both summits anyways: after all, this is DOS Cabezas we are talking about! John said that the route from south to north summit entails a tricky descent down the north face for all of five or ten vertical feet. Try as we did, nobody could discover such a relatively easy route off the south summit. We had only brought a 100 foot length of rope to be used as a handline, no seat harnesses having been taken along. Thus we were unprepared to negotiate the cliffs that were actually encountered. We thus descended the line of ascent, this time the thick brush being traversed with considerably greater speed and efficiency (doubtless owing to gravity being "on our side" on descent, and to my superlative navigation as group pathfinder 8-). 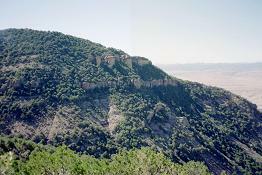 John Hamann has provided a description of Dos Cabezas Peaks at Summitpost.org. We returned to our vehicles at 1 p.m. and parted ways. I changed into street clothes and drove with Edward to Tucson. There, and with plenty of spare time, we enjoyed Kentucky Fried Chicken as our perennial treat for a climbing effort well done. Edward laughed when I presented him with a gift of soft, green, jalapeño-flavored candy shaped like a desert cactus. I was joking, of course - and listened attentively as Edward concluded a discourse on the theory of distribution of prominence values that had begun after we had checked our luggage. I am saving the silly, soft, and edible catcus (about 4 1/2 inches tall) as my reward for an as-yet undetermined future desert climb. It should be great melted on toast with butter - or as a cream cheese and jalapeño sandwich. Do I annoy you with my food fantasies? Well, write your own trip report! The evening flight went quickly. Edward retrieved his parked car from the long-term lot and delivered me to my own vehicle waiting in Richard's front driveway. This act saved me yet another taxi or shuttle fare. A grand time was enjoyed by all participants. I added seven to my list of 2,000+ foot prominence summits, bringing the total to 210. I also now have 23 of New Mexico's Fifty Finest peaks. I had transferred by belongings, and myself, into various cars no less than five times - first into Bob Packard's camper; then into John Hamann's truck; Bob's camper; Richard Carey's truck; and finally Edward Earl's rental car - a personal record of dubious merit. 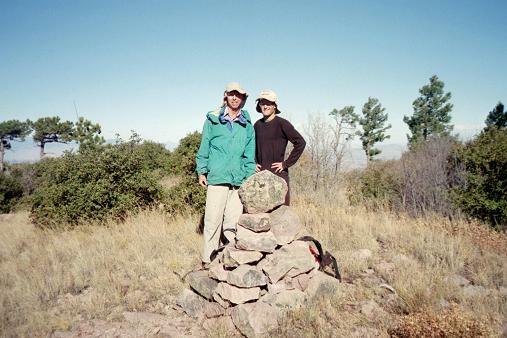 Bob Packard had continued with ascents of several more summits in New Mexico's Fifty Finest list - West Blue Peak, Timber Mountain, Gallinas Peak, Carrizo Peak, Benson Ridge / unnamed 9695, and Wind Mountain (with John Hamann). Most importantly, everybody shared in the adventure of topping-out on both Florida Peak and Dos Cabezas.